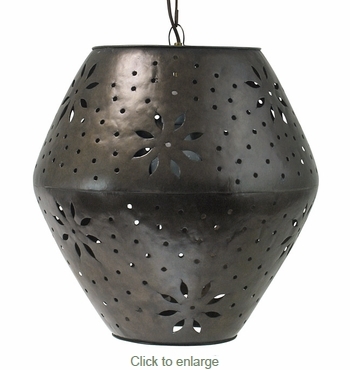 This large rustic tin Margarita hanging light with punched flower designs will add southwest charm to your home or cantina decor. This rustic tin pendant light fixture is handmade by talented artisans in Mexico and will complement any Spanish colonial, southwest or rustic theme. Since each Margarita fixture is individually hand crafted, color and finish may vary slightly from what's pictured here. • Wired with UL listed parts, but they are not UL Listed fixtures. • Includes metal hanging loop.